Trick or Treat? Perhaps the 2017 Topps Garbage Pail Kids Halloween set is a little bit of both. 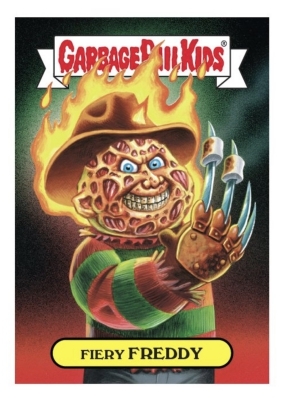 Giving high-profile horror movies and their characters a somewhat less scary appearance, 2017 Topps GPK Halloween subjects include Friday the 13th's Jason, as well as shoutouts to The Evil Dead, Army of Darkness, Freddy Krueger, and of course, Pennywise from IT. The online exclusive supplies each subject with two cards that share the same image for a total of 20 stickers. 2017 Topps Garbage Pail Kids Halloween is available only as a complete set for $49.99, containing both A and B title cards for all ten sticker designs. Collectors have just one week to purchase the on-demand release via the Topps Online Store. The final print runs will be announced after the sales period ends on November 7. 20 cards. 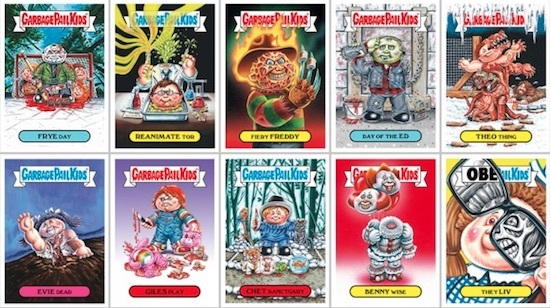 Shop for GPK Halloween Sets on eBay. Final Print Run is 272 sets. View other Garbage Pail Kids cards with our related guides.